Weight Watchers, an example of changing for the sake of change may not be a good idea? Some of us are er..mature enough (ha ha) to remember Weight Watchers from the Jean Nidetch days. I read Jean Nidetch's book in 1971 and was intrigued! The first WW meetings were just a group of friends that Jean Nidetch invited over to support her weight loss! I first joined in 1972 just after they had dropped parts of the original "New York Obesity diet" which had helped the founder to lose a lot of weight. The original Weight Watchers diet included liver once a week, fish 3-5 times a week, all the veggies you could eat (as long as they were not on the forbidden list), fruits and a longer list of foods you COULDN'T eat than those foods you could eat. Offering accountability as well as support in meetings, it remained state of the art for the 1970's as it went. Weight Watchers has not stood still. It is a multi million dollar corporation today, which, until the early 1990's was owned by the Heinz companies but then, became an international corporation separate from the Heinz companies and owned by stockholders. In 2015, possibly the most famous dieter, Oprah Winfrey, bought a 10 percent interest in Weight Watchers. Weight Watchers has a scientific advisory committee which includes some respected authorities in dieting and obesity, including Dr Judith Stern and Dr. Xavier Pi-Sunyer. Weight Watchers offers 2 programs - one which is similar to the old CORE program - you only count points for foods not on the list of allowed foods (the allowed foods are those which are low in calories and high in protein or fibre or both), and the other program which came out in 2015, is called "Smart Points" or "Beyond the Scale", which replaced the points plus program. Points Plus figured points on more factors than calories - more on amount of fibre and/or protein and we were told it was a much more accurate measurement of the energy in foods. Smart Points is different because it has no connection to amount of calories in the food. Foods with sugar or saturated fat in them, are figured very high in smart points (for example, a Hostess cupcake which is 160 calories and would have been 4 points on the older programs and 5 points on Points Plus, is now 8 smart points). The problem some of us see in "Beyond the Scale" is that the bottom line is calories in, calories out, that is it comes down to how many calories you intake - if you intake more calories than you need, you gain, less calories than you need, you lose weight (regardless of type of food consumed). The issue which led to "Smart Points" was that many members members were losing weight and following the points designated for their weight but not eating healthy. Apparently the International Committee wanted to force members to eat healthier and avoid fat and sugar pretty much completely. The recent demonization of sugar probably was a factor. Many of us lifetime members can have treats from time to time and when we asked about the fact that Smart Points does not really allow for that, we were told that lifetime members on maintenance were pretty much "on their own" anyway. So, I still attend meetings because I'm below goal so they are free to lifetime members at or below goal but I use "My Fitness Pal" to count calories as "Smart points" is too restrictive for me. Smart points or "Beyond the Scale" may work well if you can stay on it. I'm the type that if I cannot have small amounts of "fun foods", I get horrendous cravings which can lead to binge-ing so it's not a good fit for me. A Study in 2012 found that people lose more weight on the Weight Watchers program and tend to stay with the program longer than other programs. The ads claim that studies on Smart Points have provided some excellent results. Members, we are told, lost 15% more weight on Smart Points than on their former programs. But some early reactions to "Beyond the Scale" were less than positive. People described things I would have expected - unable to stay on program because it's too restrictive but also, things I would not have expected, like some described being very hungry on program etc. Smart Points is very good for losing weight, report members who have been able to follow it. Oprah says she loves Smart Points but then, she owns 10% interest in the corporation so I doubt she would do otherwise than praise the program. As for me, I no longer count points but rather have switched to counting calories using "My Fitness Pal" which I first heard about from my adult grandchildren, and that's working well for me... it's very easy to use. They have great "apps" for smart phones and tablets also which I use a lot! The WW app does support Smart Points and is also free. I also liked the "Tools for Living" which is no longer offered on program - if you click on the link, you will find 5 of them. When I eat my Daily food allotment, I don't have any GERD or reflux (I have a hiatal hernia and have suffered with this all my life. Even on a low fat diet, I would be awakened several times a night with a throatful of stomach acid.). Although I didn't do too well the first three times around, this time, journaling my food intake, I ended up losing 110 lbs to the lowest weight I'd been in 35 years - and by continuing to journal my food, I've managed to keep off 107 lbs... I hit lifetime in 2009, and have kept off my weight since then. I am a lifetime member below goal! Because Weight Watchers has a very strong support system and offers a healthy program, many medical providers feel Weight Watchers is the best way to go. When a person is a lifetime member, at or below goal, s/he doesn't have to pay for meetings! I attend a meeting, once a month (required to keep current on Lifetime membership) - hubby who used to go with me before he had 5 major surgeries and osteomyelitis and septicemia in 2016, does not go to meetings anymore. Since he is fairly disabled, barely ambulatory and I bring him his food, (I have him on Dean Ornish's low fat, low calorie plan) we have no problems keeping his weight down (among the surgeries he had were a quadruple coronary bypass, and femoral to popliteal bypasses in the left and right groin). He sustained major brain trauma from likely a fourth stroke which was brought on by the surgery so isn't too aware of what he's eating, anyway. Before all the surgeries, he would have never stood still for the restrictive program I have him on now. For legal reasons, if you have your leader set your goal, it will set be according to the BMI charts (which are underweight for most folks). So it's best to have your doctor set a healthy and reasonable weight for you, have him/her write this on a RX form and hand this to the leader to set your goal weight. (You should always meet with your medical provider before starting any weight loss program). One leader told me "if Weight Watchers really worked for most people, they would go out of business" (i.e. everyone would be at goal and a lifetime member and not paying for meetings). Truth be known, Weight Watchers Smart Points which is the current program, works very well if one follows it and attends meetings but following it turns out to be difficult for most people because of all the "forbidden foods", not openly forbidden, but not practical to eat considering how high in smart points those foods are now! Previously, Weight Watchers offered the "Healthy Guidelines" which were specifically what you should be eating to stay healthy but now, healthy eating is built into the "Beyond the Scale" program - the name comes from the fact that the program encourages exercise on a daily basis which I really like ... and that it also encourages people to "do something that is fun" (and not food) on a daily basis, another great feature but we all know that the bottom line is still "the scale". Staying on any program, even an excellent one, takes diligence on a daily basis and basically depends on how much you need it. WW solves many health issues including diabetes. You can join Weight Watchers on line. I do both - attend my meetings and am a member of the website as well although I seldom visit it anymore. We had a great community on the Weight Watchers website which combined social networking and sharing with folks who also follow program but with the launch of the new website, the old Community has been replaced with "WW Connect" which includes everyone from around the world, is difficult to post to and very impersonal and so far, doesn't run real well on a PC although they claim the PC version is "in development". Many of us have found other communities like "Sparkpeople" to chat on or even a WW community on social networking sites. WW "connect" is mostly used for people to post their before/after photos but doesn't really encourage close relationships as the only WW community did. 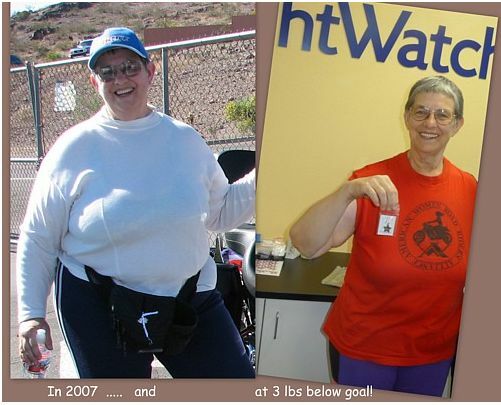 Below is my before and after photos, but the after was taken in 2009 when I was granted lifetime membership when I weighed about 20 lbs more than I do now.